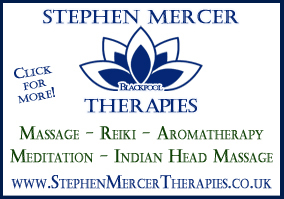 Are you a school, college, social group, club, society or perhaps a group of friends celebrating a special occasion? Are you interested in the paranormal, or looking for something a little bit different to do? Supernatural Events specialises in hosting private events such as ghost walks, talks, tours, psychic nights... and fright nights!!! Contact us to discuss how we can help. We work with some amazing locations. 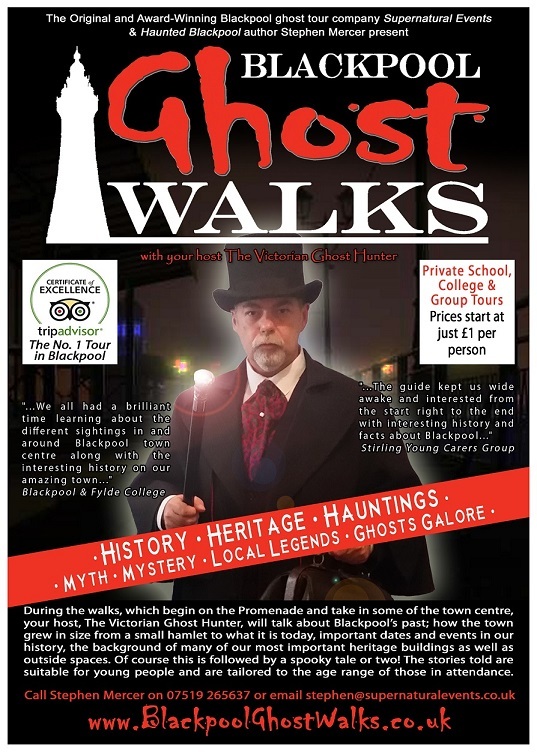 Supernatural Events operates its very popular Blackpool Ghost Walks during all holiday periods throughout the year, but we also offer you the opportunity to book a private Ghost Walk on a date and time that suits you.Starting on The Promenade, you and your guests will wander through some of the town's most haunted areas hearing stories of the supernatural and tales of terror. The hairs really will stand up on the back of your neck! Prices are dependent upon how many people are attending, but can start as low as just £1 per person. Get in contact now to book your very own spooky stroll with The Victorian Ghost Hunter... if you dare!!! Psychic Nights... and Fright Nights! Supernatural Events can assist you to give a party like no other; an evening with a difference; a unique experience. You can now host your very own Psychic Night or Fright Night in the comfort of your own home. Visit the Psychic & Fright Nights page by clicking HERE! To discuss your private tour, please call Stephen on 07519 265 637 or email stephen@supernaturalevents.co.uk. 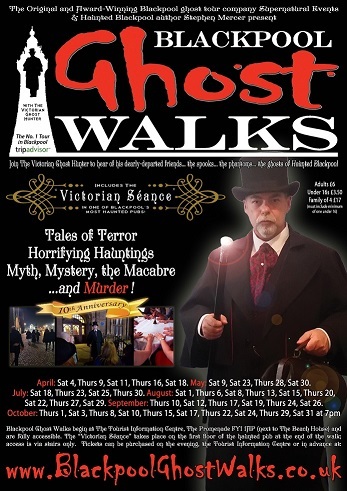 Blackpool Ghost Walks with The Victorian Ghost Hunter are back for 2019. Click the image for more details! 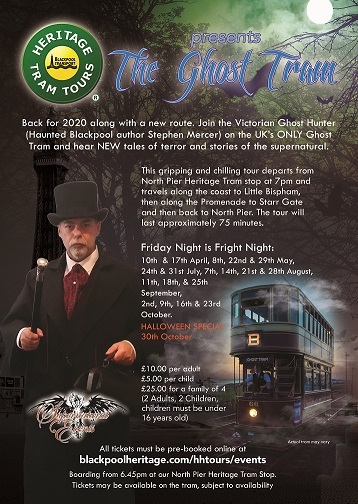 The Victorian Ghost Hunter invites you to step aboard The Ghost Tram... if you dare! Click the image for more details! premium Magento themes at magentothemesonline.com!